Ecosystem-based management (EBM) is really just a new way of describing the basic principles for managing human activities in a complex environment. You’ll find the term EBM in a lot of legislation – but it’s fair to say it’s not widely understood. When it comes to implementation, it seems difficult to answer the simple questions: “What does EBM really mean for me and my industry? In practice, what must I do to comply with EBM and its aims?” For these reasons, WWF has developed a booklet to help answer these questions and understand the basics of what EBM is and what it isn’t. 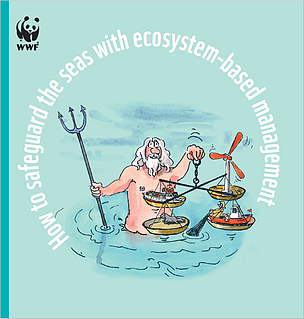 In this booklet the Baltic Sea’s geographical boundary and well-defined catchment area is used as an example to illustrate in simple terms what EBM means in practice, including some specific stakeholders. This booklet can be applied widely to other marine areas as well.